Judge Jefferson is a graduate of the Northwestern University School of Law. Prior to law school, he obtained a Bachelor of Science Degree with honors in electrical engineering from Howard University, and a Master of Science Degree, also in electrical engineering, from the University of Illinois. After obtaining his undergraduate and graduate degrees, he worked as a systems engineer for GE Astro Space and Motorola, Inc. Following law school, Judge Jefferson served as a law clerk for the Honorable R. Guy Cole, Jr. at the United States Court of Appeals for the Sixth Circuit. After his clerkship, he was selected as a Temple Bar Scholar at the American Inns of Court. Additionally, Judge Jefferson has worked in both private practice as an attorney at Latham & Watkins and as a government trial attorney for the US Department of Justice, representing the United States in IP litigation. The Honorable Trevor Jefferson was sworn in to the Patent Trial and Appeal Board on March 1, 2012. During his tenure on the court, Judge Jefferson has ruled on over 80 petitionsand has issued seven written decisions— canceling all instituted claims in four petitions, canceling some claims in two petitions, and refusing to cancel any instituted claims in one petition. Notable rulings include Judge Jefferson’s decisions in five related Inter Partes Review (IPR) proceedings (IPR2015-00261, IPR2015-00262, IPR2013-00419, IPR2013-00424, IPR2013-00412) involving auto giant Toyota Motor Corp, resulting in two final written decisions. In IPR 2013-00424, Judge Jefferson opinedthat Toyota failed to demonstrate that the challenged claims in U.S. Pat. No. 5,845,000 owned by American Vehicular Sciences, LLC (AVS) were unpatentable under 35 U.S.C. §§ 102 and 103. In another IPR proceeding initiated by Toyota against AVS, IPR 2013-00419, Judge Jefferson ruledthat many claims of U.S. Pat. No. 6,772, 057 challenged by Toyota were unpatentable, but did not cancel several others. Further insight can be gained by viewing Judge Jefferson’s record on Docket Alarm’s statistics platform. 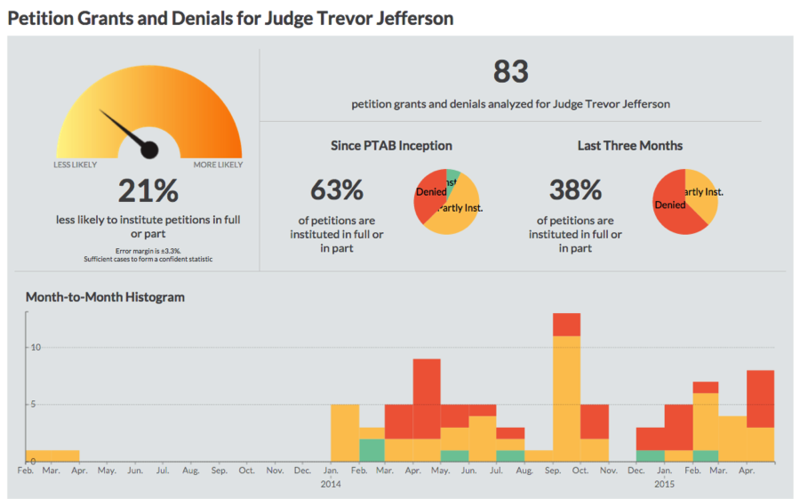 Users can view statistics on how many petitions Judge Jefferson is hearing per month, petitions he has instituted, final written decisions he has issued, the parties and firms that have appeared before him, and much more. For example, based on analysis of his 83 petition grants and denials, Judge Jefferson is, on average, 21% less likely than his colleagues to institute petitions in full or in part. Additionally, he is 26% less likely to invalidate all instituted claims than his fellow administrative patent judges. Lawyers representing both petitioners and patent owners can use this information to determine what direction their litigation strategies need to take, such as whether or not to file a petition and what claims to contest if appearing before Judge Jefferson. - Search all documents filed in all of Judge Jefferson’s cases at the PTAB. - View Judge Jefferson’s judicial profile, with statistics on petition grant rates, final written decisions, and other data. Note: All statistics regarding Judge Jefferson were pulled on May 29, 2015 and accordingly may not reflect the most up to date statistics. Docket Alarm subscribers have full access to current statistics on Judge Jefferson and all other PTAB judges.